I will attempt to mirror February’s status as the shortest month of the year by making this a shorter-than-usual post. Once again, highlights are organized using my RAW NEWS framework. This month was a bit unusual in that of the thirteen books read, six were novels. I tend to read more nonfiction and, if the topic interests me, I usually enjoy the book. My response to fiction, on the other hand, is considerably more variable. This month there was one novel that scored only 2 out 5, reminding me that there are some instances where the Hallmark Channel movie is far superior to the book. But I did read three novels that were solid 5s for me. If you enjoy clever and quirky, check out We Are All Completely Beside Ourselves and Wit’s End by Karen Joy Fowler, as well as Sophie’s House of Cards by Sharon Oard Warner. Last month, I didn’t make much art. This month, I was a collage-creating machine! The Resistance collage I included in last week’s post on that topic is one of ten collages created in February. “She’s Gone” is based on a dream of a young girl’s death. “Princess” was created after watching some particularly annoying brides on Say Yes to the Dress. This is my favourite kind of collage, the one that emerges from somewhere deep within. It’s titled Gargoyle and the Quest. When I focus on something, other things fall by the wayside. That happened this month with my writing. I didn’t write a word on my grandmother project. 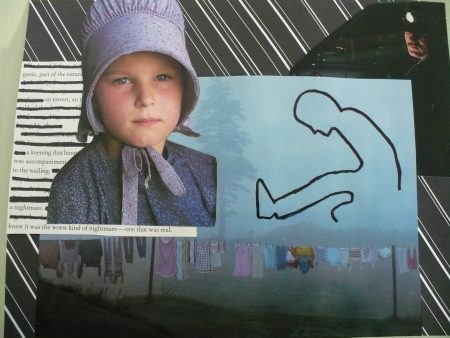 Instead, I wrote journal entries about the story that each collage was telling me. It’s okay. I wrote, it was useful writing (to me), and I had fun with the art. I just have to accept the fact that I am not a good juggler. The biggest, shiniest ball will always have my undivided attention! Intuitive Eating will probably turn out to be one of the most challenging and mind-bending things I’ve ever done. But I have made a little bit of progress this month. Intuitive Eating is our topic for next week’s post. The 26th of February was a special day, one year to the day that Shylah came into my life. You can read about my Mexi-mutt in several places, such as this post about her first 48 hours and this one based on her first month with me. I am elated to report that Shylah has been eating out of a bowl for the last two weeks and drinking water during the day. Her progress gives me lots of energy. On good days, I’m so happy I feel like I’m flying. Some experiences are also energy-producing. This month’s excursions included watching the movie The Big Sick with a friend at an wonderful independent theatre in my community where the owner serves tea and cookies. And a superb theatrical production of Sister Act, again in the community. I am so fortunate to live in a rural/small town area where the arts play such a big role. Tarot is a topic of recent fascination and I’ve decided that I want to learn all about tarot cards. I’m nervous even mentioning my interest for fear you’ll think I make regular calls to 1-800-Fake-Psychics. I don’t! The ritualistic trappings don’t interest me. What does is Tarot as a means of self-exploration. I’ve read a few books and bought a couple of decks of cards. (Some say that your first tarot deck needs to be a gift, but that’s one of the things I choose to ignore.) So far I’m having a ball. I’ll say more as I learn more. So that was my February. How was yours? Oh, I’ve read We are all completely beside ourselves! I remember cataloguing it for the Women’s Library and it looked so good I took it home. I really enjoyed it. Must look out for Wit’s End. I won’t give it away for the others, but you’ll know what I mean when I say that my entire childhood, I read the books of the families who did what was done in We Are All Completely Beside Ourselves. My dream was to be an adult who would do exactly that. 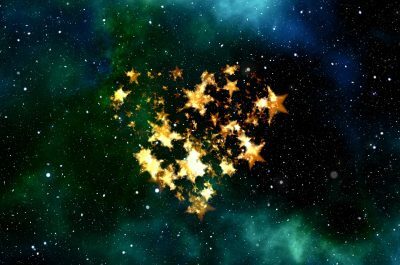 Hi, Karen – I love how you have combined your dreams with your collages and your writing, and gave that much focus this month. Your collages are very intriguing. Congratulations to Shylah for her continued successes. She must be feeling safer and safer to make those steady gains! I look forward to reading your post on Intuitive Eating next week. Thanks, Donna. I was just reading a post by Cesar Milan. He said that the task with fearful and anxious dogs is to ensure that they keep having tiny successes so they can build their self-confidence. He also says that it takes years, not weeks or months, to achieve this. My experience is that he is right! I’m glad we’re able to celebrate these small victories. Oh wow, I love your collages, Karen! Great job! The Gargoyle and the Quest collage is one in particular that grabbed my attention. I really like the elements and colours in that one. LOL, your juggling hornet picture had me scrolling back up a few times to take another look. I think it is only natural to focus on the biggest, shiniest ball … I do it too. I like the more inclusive switch to Energy instead of Exercise…and the news of Shylah’s HUGE progress is inspiring after those frustrating and worrying first weeks and months. I think it is safe to say you have made as big a difference in her life as she has in yours. You may have rescued her but she seems to have rescued you right back. Has it been a year already?! Thank goodness you don’t buy into the woo-woo ritualistic trappings of Tarot card readings. I am all for using anything that works as a means of self- exploration. My stepson has Tarot decks although he has never done a reading on me. I was with him when he purchased his first deck (so you are not alone there). I hear the tarot cards themselves can be works of art. My February consisted of reading four (almost five) books which I very much enjoyed. I spent a lot more time reading in February than I did in January. I am 2 books behind on my reading for my 2018 challenge according to Goodreads but I don’t care – I am happy with the progress I am making. 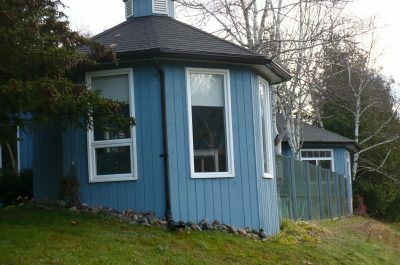 That is soon to go by the wayside though as I now need to plunge into doing our taxes and readying the website I have been creating for our church for its April 1 rollout. I did produce more uploads on my YouTube channel last month than any month since starting the channel eight years ago. I am tremendously proud of that accomplishment – I told my viewers that I would be uploading more this year and I am following through on that promise. The Big Sick is definitely worth seeing. You’re right about Shylah rescuing me back (shades of Pretty Woman!). And your stepson is right about the tarot cards being works of art. I’ll definitely talk about that in a future post. Congratulations on an outstanding February, especially on so many videos on your YouTube channel. I know that’s a huge time commitment, so your dedication is noteworthy! Congratulations, Karen, for your continued successes with Shylah! I just read your previous posts about her first 48 hours and first month with you. Beautiful stories and Shylah is a beautiful dog. I’m impressed with your art collage, too. Look forward to reading your post on Intuitive Eating. Thanks, Natalie. And I appreciate you going back and reading the initial posts about Shylah. It’s definitely unusual for a dog not to eat out of a dish, so I’m glad you saw the history that explained that. Karen, 10 collages! And with stories for each… Wow. I was intrigued with your resistance collage and told myself to do one on my own resistance. Which I seem to be resisting doing. LOL. I did my first ever tarot card reading (by a professional medium) last year right about this time and found it very helpful in self-exploration. And I believe it gave me what I needed at that moment of my journey. I’m eagerly awaiting your learning. And which books you found most helpful in your learning. I love your monthly summary of RAW NEWS elements. It allows you to see what you have accomplished in the month – even if not all elements are to the level you would have liked, it shows what shiny ball(s) was most intriguing! (I’ll reiterate – 10 collages. Oh and a mere 13 books… wow). On this gloomy, rainy, cold March 1 morning, perhaps I need to look back at my February in this way and celebrate the positive accomplishments. Resisting a resistance collage…. hmm, interesting (she says, stroking her chin as if it were a beard, which on bad days and with hormonal changes, it sometimes feels like). Of course you’ve had a tarot reading done, my twin. I haven’t done that yet, but intend to. Once I feel better able to do my own reading, I’ll be interested to see how a professional would read the cards differently. Yup, it would be good for you to celebrate your positive accomplishments from February. I’ve just read your post – am about to comment – and noted the focus on the newly positive you! Celebrating your accomplishments is just part of that. Thanks, Kathy. Like you with your use of the SMART acronym, I find that RAW NEWS provides just a wonderful framework for my days and weeks. It took me a long, long time to come up with it, but once I did, it has opened so many doors and made things so much more clear. I appreciate your interest in tarot. I’ll definitely be writing some posts about that soon. 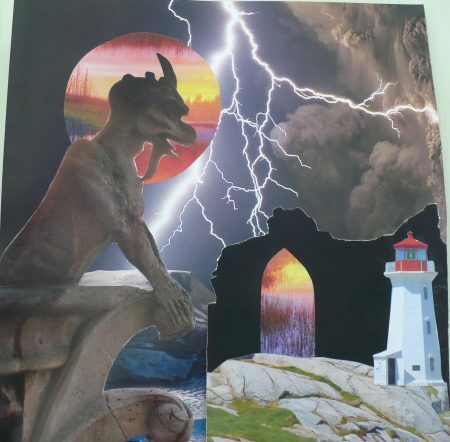 Your collages are beautiful Karen – you are so talented and your ability to explore and know yourself is incredible. Looking forward to hearing all about intuitive eating! I am also really glad to hear that Shylah is making more progress. Even though I am not a dog person I really enjoy your stories about her. Maybe you could bring your tarot cards to our next meeting! Next week’s post for sure, Fran for the intuitive eating info. And sure, no problem bringing my tarot cards to our get together. Could be a fun element! I do love quirky and clever so I have added your 2 books to my Want to Read list on GoodReads. Thank you Karen! And thanks for the updates! I have not delved into collages (except as the basis of a vision board) but am intrigued by yours. I’m looking very much forward to your Intuitive Eating post. And I enjoyed reading your posts about Shylah – I’m glad she is blossoming under your care. Have fun with the tarot. Like you, I think it is a good tool for self-exploration. I haven’t heard the one about receiving your first deck as a gift. I received my 3rd deck (Tarot Art Nouveau) as a gift, if that counts ;-). Keep on rocking and RAWing! The book Sophie’s House of Cards might be of particular interest to you because it is structured around a Celtic Cross reading. Every chapter opens with a card, the explanation for the card, and then the narrative that brings that explanation to life. It’s not as quirky and clever as the two books by Karen Joy Fowler, but it’s definitely a unique structure for those interested in Tarot. I’ve just ordered by third deck of cards – Voyager, where all of the cards are collages. I can’t wait to get it! Your collages are amazing, Karen, and I would beg to differ with you that didn’t do ‘art’ in February. They are works of art! I like your switch from exercise to energy. In so many ways exercise has a negative connotation – something you ‘should’ do. I like exploring energy levels and activity is a direct outcome of one’s access to energy. I love your RAW NEWs. I’m excited about your tarot card exploration – something I have kept at arms length. Thank you, Molly. I love making collages. And thank you also endorsing the switch from exercise to energy. I agree with you completely. I’m fascinated by energy levels and all of the various ways we can improve them, but I definitely find that the term ‘exercise’ kicks my energy to the curb. I’ll look forward to you helping me open my mind about the tarot cards! Tarot seems to be an emerging theme for this year, and I recently had my first Tarot reading in almost 40 years. I had a very good friend in my late teens and early 20s who was very adept at reading cards. She often used ordinary playing cards. I tried so hard to learn from her, but I think it takes the ability to think holistically, and certainly at that time I was too linear. Recently my interest has been nudged again. Many of the things she told me all those years ago make sense now only in hindsight. I’m very interested in reading more about your learnings from Intuitive Eating. Your post on overcoming resistance caused an aha moment for me and I too have been venturing on a journey of self-discovery with intuitive eating. It’s still much to early for me to raise the victory flag, but so far I’m very optimistic. That’s so interesting that your friend used ordinary playing cards. I don’t think I could do that either Joanne, certainly not in my teens or 20s but not even now in my 50s. I also don’t think I could do a reading for other people right now, but I have been learning tons that make my readings for myself increasingly richer and more interesting. I hope your recent reading was a good experience. As for the Intuitive Eating work, yes! Congratulations to you for being on that journey and for being in a good place with it right now. I’m really happy that we’re both doing this work. It’s far less lonesome. Eventually we will have to compare notes on Intuitive Eating. Just some food for thought – my Tarot reading friend once told me that it’s difficult to do a decent reading on yourself. We have too much vested interest in ourselves and have difficulty seeing the bigger picture and more objective theme of the cards. As a result, what you think the cards are saying compared to how an objective person may interpret them are likely to be very different. I love your collages, Karen. I have only ever made these as a child, when I didn’t even consider them art. Your examples surely belong in the art category and even naming them is such a creative and cool thing to do! As far as your writing last month, I think it is productive and great to be focused. Distractions can mean the (temporary) end of projects. Some writers can work on several themes/projects/manuscripts at the same time, others prefer to focus on the shiniest ball for a while. Nothing wrong with that! Thanks, Liesbet. I appreciate your comments about the collages and the writing. And also about the tarot. I’m looking forward to hearing more about your fast-moving February. If any month is going to fly by, I’m happy when February does so. Of course that’s because I live in the land of ice and snow at this time of year. You quite likely have a different take on things! While I hate the cold and snow (and we seem to be having quite a bit of that last fall and the end of this winter), I embrace days where I “have to” stay inside and be productive or read. The only problem during cold spells is that you can’t really walk dogs indoors. 🙂 And, husbands who complain about being cold. Not selfish at all. If I weren’t feeling generally blah today, I would be joining you in wanting to savour every moment. It’s a great way to be. And you’re right too about the cold and snow. Bad weather allows for great hygge days. Dogs are definitely the big exception. I have a treadmill, but haven’t attempted to train the dogs to walk on it. Are there actually people who train their dogs to walk on treadmills, or was that a joke? 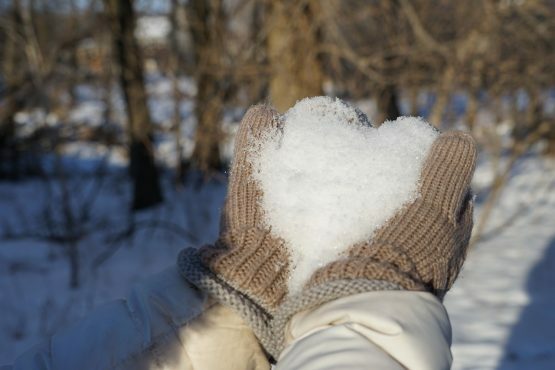 🙂 Hope you are feeling less blah, a few days further into winter. 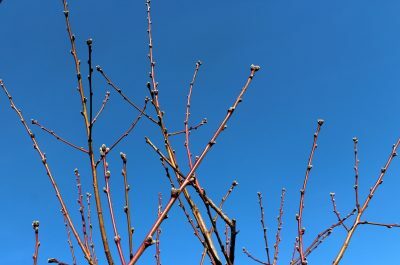 Spring is around the corner, by the looks of many people’s blog posts. Here in New Mexico, on the “mesa”, there are no signs yet! It is actually quite possible to train a dog to walk on the treadmill. Probably not Shylah yet – she’d be too scared – but Toffee could learn, no problem. You’re back in New Mexico? I don’t think I’d realized that was your destination after San Diego. I’m envious. I would absolutely love to return to New Mexico. There’s just something about that state that captures my imagination. I always enjoy your RAW NEWS write-ups. And, I like the change from Exercise to Energy yay, Shylah!). I read more novels than non-fiction (by a long shot) so I’m grateful for your recommendations (and the second vote from Anabel for We Are All Completely Beside Ourselves). I’ve read and enjoyed a few other books you’ve mentioned, so I will check to see if I can get these from our library. Thanks, Janis. It really means a lot to me to know that people like the RAW NEWS updates. I won’t say anything about We Are All Completely Beside Ourselves for fear of spoiling it for you. If you do read it, I’d love to know what you think. 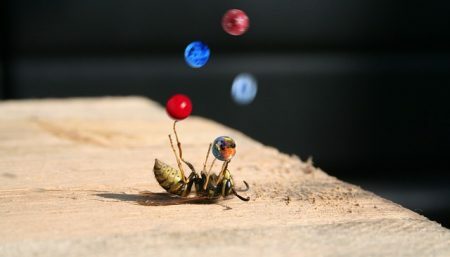 I laughed to see the image of the yellow jacket on its back juggling marbles. That was so completely me in my recent work life. Never again! Isn’t it wonderful to be able to say never again and mean it! I was just having a conversation this morning with a friend, also in education, and we were laughing about my fervent claim that I didn’t know how I’d survived my career. I truly mean that. When I look back, I just shake my head. Who was that woman?